The next overlook is Tawa Point. Tiponi Point, No Name and Tawa Point offering expansive views of the Painted Desert are all clustered together on this first 1 3/4 mile stretch of Park Road. Tawa is the Hopi Sun God. Hugging the edge of the mesa the rim trail at 5,826 feet begins here. 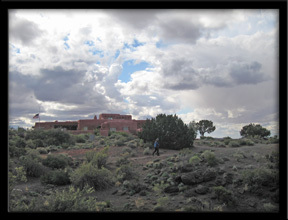 Walk the .06 miles each way to the Painted Desert Inn on a self-guiding trail. Signs along the way describe points of interest include geology, plants, animals and people. Keep a sharp eye out for the horned lark, golden eagle and ravens as they soar the thermals here at 5,826 feet above the desert floor. This entry was posted in National Parks, Petrified Forest and tagged Arizona, Painted Desert, Painted Desert Visitor Center, Park Road, Petrified Forest National Park, scenic overlook, Tawa Point. Bookmark the permalink.